Mayor of Brazilian city Porto Alegre, Jose Fortunati, says his city may drop out of June’s football World Cup if key legislation is not approved this week. Mayor Jose Fortunati told a local Radio Gaucha that “there was no plan B” to find much-needed extra funding. He says a bill creating tax breaks for companies investing in temporary structures for the tournament must be voted on Tuesday. The Brazil World Cup starts on June 12 but some cities are behind schedule. 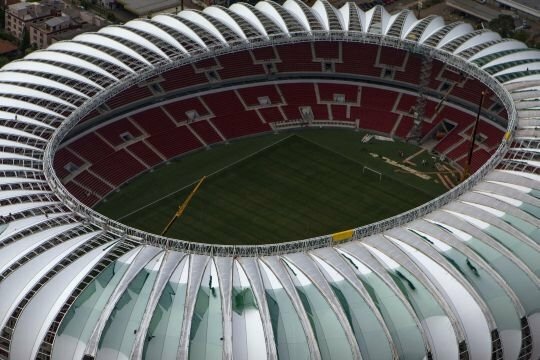 Porto Alegre’s Beira Rio stadium is nearly ready, but it still needs temporary structures to house the media, sponsors and other requirements by the world football governing body, FIFA. The outside of the stadium in the southern Brazil city, due to host five matches, including fixtures with France, Holland and Argentina, is still unfinished. However, in an interview with local Radio Gaucha, Jose Fortunati said he was more worried about the temporary structures. “If the project is not voted, we won’t have the World Cup in Porto Alegre. There’s no Plan B, nor C nor Z,” he warned. The legislation that allows tax exemptions to firms that invest in the structures was poised to be voted by the Rio Grande do Sul state legislative assembly on Tuesday. The authorities are not allowed to use public money in structures that will not be used after the World Cup. FIFA Secretary General Jerome Valcke said on Friday that delays were most worrying in Sao Paulo’s Arena Corinthians – set to host the opening match – and in Porto Alegre’s Beira Rio, just under three months before the tournament.